We hold two sets of events each year approximately sixth months apart. These allow current and prospective users of our services to discuss use of the systems, aspects of running rotas and what improvements should be considered for future development. In March we hold a large event in central London. During the autumn we hold a series of smaller events at cities across the UK. In 2015 events were held in Bristol, Manchester and Newcastle. In 2016 the events are being held in Birmingham and Edinburgh. 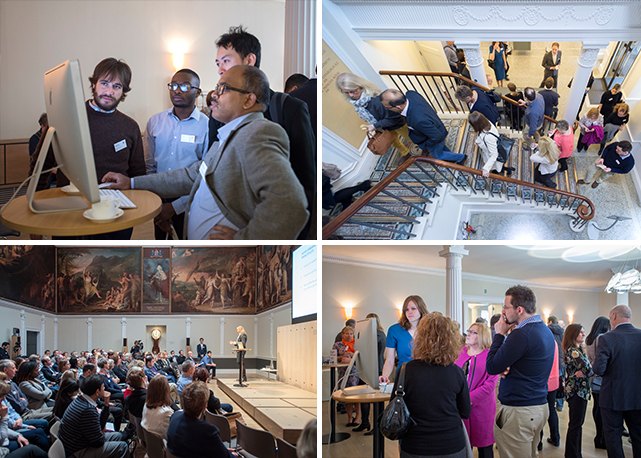 Our spring 2019 event was held at the Royal Society of Arts in London on the 22 March 2019. The event featured talks from three guest speakers including Jos de Blok, CEO and founder of Buurtzorg, as we focused on the subject of balancing organisational structure with departmental flexibility. Our Winter 2018 TDR event provided a forum for implementation co-ordinators at Trusts rolling out Trustwide Doctor Rostering (TDR) projects and other interested parties to share ideas about effective rollout strategies and to provide feedback on our proposed system developments. Our September 2018 event was a training day held on Friday 28 September 2018 at the Stanley Building in Central London. The theme of the event was "operational effectiveness" with three guest and seven Rotamap presentations. The March 2018 Rotamap event was held on 23 March 2018 at the RSA in central London. The theme of the event was improving information flow. Our autumn event was held on 5 October at The Library of Birmingham and had the theme of "situational awareness". The March 2017 Rotamap event was held on 24 March 2017 at the RSA in central London. The theme of the event was Improving Performance and enabling teams to better work together. The second of our two Autumn events was held on 6 October 2016 at Dovecot Studios in Edinburgh. The first of two Autumn events was held on 29 September 2016 at The Library in Birmingham. The March 2016 Rotamap event was held on 18 March 2016 at the RSA in central London. In the autumn of 2015 we held a series of smaller, regional events for CLWRota and Medirota. They were held in Bristol, Manchester and Newcastle. The March 2015 Rotamap event was for both CLWRota for anaesthetists and Medirota for surgeons and medics. The event took take place on Friday 20 March 2015 at the Royal Society of Arts (RSA) in central London. The 2014 Forum was held on Friday 19 September at King's Place in central London. The event included presentations on making the best use of data to help the department improve and use of flexible sessions as well as the latest cross-departmental benchmarking data. The 2014 Training & Management Day took place on 20th March 2014 at Kings' Place in Central London, and was attended by over 100 existing and prospective clients comprising of consultant anaesthetists, managers and administrators. The day was split into two parts: a training session in the morning and an afternoon session devoted largely to management-related issues. The 2013 Forum was held on 19 September 2013 in the Battlebridge Room at King's Place, close to the King's Cross and St. Pancras stations in central London. The event included presentations from several external speakers, talks from the Rotamap team and the presentation of the latest benchmark reports. The 2013 March Management & Training Day took place on 21st of March 2013at the canal-side Battlebridge Room at King's Place, close to King's Cross station. The event was attended by close to 90 managers, clinical office holders and senior administrators who wished to learn more about CLWRota and the team's plans for improving both its operational and management functions. The 2012 Forum was held on 13 September 2012 in the main auditorium at the Wellcome Collection in central London. Two external speakers, Dr Will Wight from the RVI in Newcastle and Stewart Nisbet from Lewisham, spoke about different aspects of using CLWRota and how they managed department performance. At the 2012 March Management & Training Day the CLWRota team presented several graphs showing both individual department and cross-departmental activity. The main focus of analysis data was cross-departmental benchmarks which incorporated data from 26 departments which have used the CLWRota anaesthetics rota management system for at least 12 months. The 2011 Forum was held in London on the 14th of September at the Wellcome Trust. The focus of this year's event was department productivity and reports. In 2011 we held our first Training and Management event. The event was held at De Vere Venues West One on Portland Place in London. The Management event was our first attempt at collating and presenting benchmark data on departments using CLWRota. The 2010 Forum was held at the Wellcome Trust in Central London, with around 55 attendees from 30 departments. The event brought together existing and potential future users of CLWRota to discuss anaesthetics rotas in general and the CLWRota system in particular. Around 45 attendees attended the 2009 forum on the 17th of September 2009 at the Design Centre in Central London. Speakers at the forum focussed on the effectiveness of the system and gave insights about training aspects of the system. The genesis of the system was also discussed, and we also had a theoretical discussion on how services organisations can improve their operations.